Scour the African deserts for a rare glimpse of the mighty lion and his pride. Click here to play! This is an adventure that you can't pass up as you will come face to face with some of the most majestic creatures in the animal kingdom. The more lions you find, the better as you will be handsomely rewarded for your first-rate research. Gas up the Land Rover and head out in search of the Lion's Lair. You're in search of the Male lion. He only appears on reels 1, 3 and 5 so keep your eye out for him. He's very important in that he will substitute for most other symbols to help you create winning combinations and he doubles your prize when he appears in a winning combination. If you're lucky to spin five lionesses, you'll receive a hefty reward. They pay out 3250 times your original line wager. Two to five Zebras will pay out up to 2500 times your bet. Flowers and tracks will also reward you, so keep your eyes peeled for those as each will give as much as 500 times your bet. The Lion's Lair is the real prize of this expedition. Two or three of these anywhere on the board will multiply your total bet. As if that weren't enough, if they appear on reels 2, 3 and 4, they will trigger a scatter feature that awards you with 12 free games! Gear up for one exciting African adventure that will pay off huge if you can manage to find the Lion's Lair. Two to three of the Lion's Lair icons will multiply your total bet respectively. 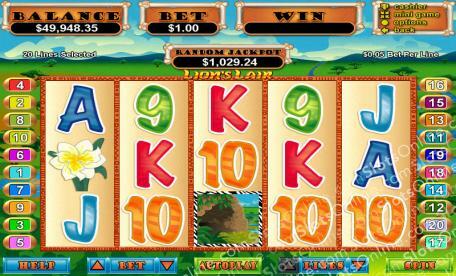 If these scatters appear on reels 2, 3 and 4, they will trigger a feature in which you are awarded 12 free games. Once the feature is activated, a screen will pop up in which you get to choose from 3 different multipliers (2, 3 and 5). Each multipler will be used on 4 of the games. You pick which order to go in. The mighty male Lion with it's dark main will substitute for all other symbols excluding the scatters. He only appears on reels 1, 3 and 5 and all prizes are doubled when he appears in a winning combination.